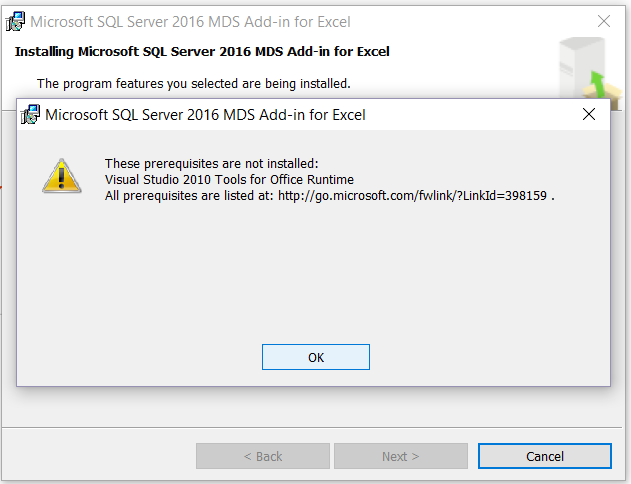 Prerequisites of SQL Server 2016 MDS Add-in not installed. Applies to: SQL Server 2016. Visual Studio 2010 Tools for Office Runtime. All prerequisites are listed at: http://go.microsoft.com/fwlink/?LinkId=398159 . • Minimum of 1 GB of RAM (2 GB or more is recommended. The Visual Studio 2010 Tools for Office Runtime is needed even when Microsoft Office 2016 is installed. It can be downloaded from here.